Update (3:35pmET): Six-and-a-half hours after the hearing began, Chairwoman Maxine Waters motioned to close, urged the bank CEOs to come up with a solution for the student loan crisis (despite them earlier telling her that they had all exited that business about a decade ago) and thanked the witnesses for coming. The hearing ended after a brief closing statement. Update (3:15pmET): It looks like the Dems have saved the best for last (or at least near the last). With what has been a marathon, 6-hour-plust hearing drawing to a close, Ayanna Pressley and AOC were called by Chairwoman Waters in quick succession to bash the CEOs for red-liniing, 'pink'-lining (mortgage lenders alleged discrimination against women) and choosing to pay fines as a 'cost of doing business' to do business the way they want, not in a way that protects consumers. AOC asked if banks factor in the cost of fines in their risk analysis when deciding whether to push legal boundaries. Amazingly, AOC offered a sliver of praise for JPM in its decision to pull out of funding for private prisons. She then asked Corbatt a technical question about the Fed's decision not to activate the countercyclical capital buffer, and whether the Fed was letting banks off the hook by not tightening capital rules. Corbatt disagreed. Overall, it was a surprisingly tame 10 minutes. Update (2:24pmET): Rep. Wexton, a Virginia Democrat, put forth one of the most difficult questions of the hearing: Do you think somebody who believes in a return to the gold standard, and who thinks the Fed should've hiked rates during the financial crisis, would be a good candidate for the Fed? She made it clear with her preface that she was talking about Stephen Moore. The consensus? It's not our job to pick members of the Fed board, that's why the Senate has a confirmation process. Dimon went a step further, saying those ideas would be 'troubling' in a Fed governor - though he added that he doesn't think those are Moore's beliefs. Update (2pmET): Calif. Rep. Katie Porter caused a stir when she whipped out a white board to do some quick calculations about how a female teller and single mom at a Chase manages to support herself and her child in Irvine, Calif.
One of her colleagues called a point of order on the use of signs during hearings, and Maxine Waters eventually ruled that it was against committee rules. But putting away the white board didn't stop Porter from tearing into Dimon, who demurred when asked how Porter's constituent should make up for the $500 budgetary shortfall she faces every month. Update (1:50pm ET): Rashida Tlaib is up, and she's asking a long-winded question about climate change and what the big banks are doing to stop it, since the negative effects, like asthma caused by America's notoriously unclear air, disproportionately affect her constituents, many of whom are poor. "Would you be willing to restrict what your bank finances if found out it is making climate change worse?" Dimon replied that JPM has already started with green initiatives, though in the mean time, Americans need energy to "eat, drive" etc. She accused the banks of 'greenwashing' their commitment to climate change and 'gaslighting' the American people, before asking them to end their financing of companies that deal in fossil fuels. Earlier, a Congressman questioned the bank CEOs about the viability and risks associated with cryptocurrencies. Amazingly, Goldman's 'fake news' crypto trading desk was raised before any mention of 1MDB. Update (1pm ET): Waters has called a ten minute break from the proceedings before the hearing's third, and final, segment. Though virtue-signaling from Democrats accusing the banks of not doing enough to prioritize the hiring of women and minorities, and ignoring the financial needs of small businesses, has largely dominated the conversation, some lawmakers from both parties managed to sneak in a few more technical questions about compliance with the military lending act and the need for a broad cybersecurity standard. One Democratic Rep. asked the CEOs whether they hire dreamers (undocumented immigrants brought to the US as children) and whether they would help them with their renewal paperwork to continue receiving protections under DACA. All the CEOs affirmed that they would hire dreamers, but said they needed to get back to the Congressman with an answer on the renewal applications. Of note: We still haven't heard from AOC. Should she get a chance to ask a question, it will likely be one of the most closely watched episodes of the entire hearing. Update (12:35pmET): Jamie Dimon's explanation of the risks to the global financial system from breaking up the big banks (pushing more credit to shadow banks) was interrupted by a protester who shouted at him about JPM being the biggest backer of the fossil fuel industry before she was swiftly removed. Rep. Beatty, a Dem from Columbus, Ohio, blasted the CEOs for not hiring enough minorities and women and demanded that they open an office of minority inclusion that will report directly to the head of HR. Clearly, the Dems got the tap on the shoulder to step up their game during the half time break. Afterward, Rep. Williams, a Republican, quizzed the CEOs on whether they identified as capitalists or socialists. Unsurprisingly, they all affirmed their allegiance to capitalism, aiding the Congressman in making his ultimate point: "We need to put socialism on trial and do it today." One twitter wit joked that perhaps Williams should have been more specific. Update (12:27pmET): Connecticut Rep. Jim Hines, who represents Fairfield county, a haven for wealthy Wall Streeters, asked the CEOs for their opinions on the scariest part of markets today: Several said leveraged loans and student loans, issues that we've explored at length.
.@jahimes asks the CEOs to name the weakest, scariest part of the markets today. Several say: Leveraged loans and student loans. $GS's David Solomon says market structure, shadow banking. Update (12:13pmET): Rep. Cleaver, a Democrat from Missouri, bashed the bank CEOs by asking whether any of their institutions practiced 'the Rooney rule' - the NFL's policy mandating that ethnic minority candidates be considered for head coaching jobs and senior operations positions. He followed that up by asking what the banks are doing to meet the needs of the 'unbanked' - a self-serving question if there ever was one. Moynihan tried to deflect by focusing his answer on small businesses. Update (12:11pmET): JP Morgan's financial support for slavery has entered the conversation, courtesy of Rep. Green, a descendant of slaves. Update (12:10pmET): The second half of the hearing started with a flurry of virtue signaling as Texas Rep. Al Green pointed out that all seven of the CEOs standing before him were white men. When he asked whether a minority or a woman were likely to succeed any of them, none of the CEOs raised their hands. As one reporter pointed out, that's not a great look for JPM CFO Marianne Lake. 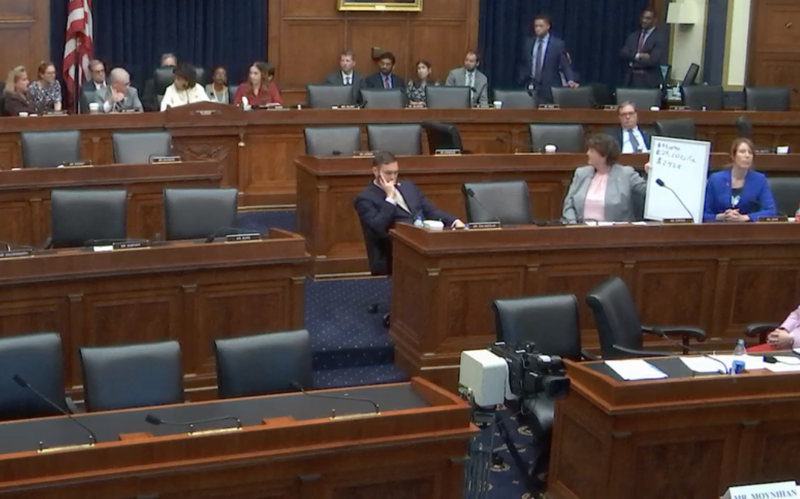 Update (10:45amET): The hearing has entered a recess so the committee can deal with some votes pending on the floor, according to Waters. The CEOs will return for the second half of their public flogging shortly. During the latter part of the hearing's first half, the CEOs were asked about alternatives to foreclosure, their cyber security strategies and something called the Current Expected Credit Loss rule. Though Goldman's role in 1MDB hasn't yet been raised by any of the group's interlocutors, Lloyd Blankfein couldn't resist chiming in with some light-hearted ribbing. We imagine he will continue to be immensely entertained by lawmakers' posturing from the comfort of his yacht/hot tub/day spa or wherever he's choosing to spend his retirement. Update (10:25amET): The troubling trend of Reps using their time to castigate the CEOs instead of asking questions continued with California Rep. Brad Sherman. He questioned the CEOs about 'forced arbitration' after declaring "too big to fail is too big to exist", after explaining how the House narrowly avoided disaster by refusing to buy the bank's toxic assets during the crisis and instead buying preferred stock. Update (10:12amET): NYC Rep. Velazquez became the first to address the ratio of CEO compensation to employees: Corbatt, who apparently is paid the most relative to his employees, took the brunt of her questioning. Again, Dimon's own words were used against him, as Velazquez asked him if he would support undoing Trump's corporate tax cut: He replied 'no'. She also accused him of being 'disingenuous' with his comments on income inequality. Velazquez continued the trend, observed by both Republicans and Democrats, of interrupting the CEOs and 'yielding' or 'reclaiming' their time. Update (10:10amET): Rep. Wagner, a Republican, gave banks the opportunity to explain how they offer economic opportunities to American citizens by making mortgages and offering employment. Update (10amET): Three questions in and we're already talking about guns. Rep. Maloney thanked Citi and BofA for cutting ties with gun manufacturers after Parkland. She then chastized Dimon for talking a big game in his shareholder letter, while arranging loans for makers of military style firearms, and the fact that last year JPM took partial ownership of Remington. She also accused JPM of refusing to adopt a policy about responsible lending to the gun industry, even as competitors have done so. Will JPM commit to adopting a formal policy that ensures responsible lending to the gun industry, she asked? Dimon said JPM has a "small relationship" with gun manufacturers who also supply the military and police which JPM holds "in the highest regard". Next up - overdraft fees: She accused Chase of being one of the worst offenders in overdraft abuses, and accused Dimon of "gouging" their most vulnerable clients. Dimon said the bank changed its overdraft policy in 2009 to require clients to opt in. Maloney has proposed legislation to force banks to "re-order" customer transactions to make sure important large payments like rent checks are processed first. Update (9:50amET): Waters started the hearing by asking what banks are doing to identify any "Russian related accounts" and whether they've identified any "suspicious accounts or transactions." Her screed began by bashing Deutsche Bank for its reputation for money laundering, and asking what the banks are doing to not be like Deutsche, in essence. Most of the CEOs either wouldn't comment, or said they haven't taken any actions. All the CEOs except for BNY said they had eliminated at least some business lines since the crisis. Asked about the student loans crisis, most of the CEOs said they had stopped doing student loan lending. Finally, she briefly grilled them about their lending to small businesses, before handing things off to the ranking member, North Carolina's Tim McHenley, who drove home the point that all of the banks lend to small businesses. His questioning then turned to Brexit and whether it poses a challenge to the global financial system. The consensus was that though Brexit was certainly a 'challenge' for the global financial system, and the outcome and ramifications are still uncertain, they don't believe it rises to the level of systemic risk. Asked about their preparations for Brexit, Corbatt said Citigroup had moved some of its operations to Dublin and Frankfurt, a sentiment that was echoed by the other CEOs. Questions about the bank's investments in China came next, notably their decision to exit certain business lines and whether their decisions to exit had to do with unique risks tied to China. Solomon said their decision to sell wasn't related to broader issues relating to China. Update (9:25amET): Rep. Alexandria Ocasio-Cortez has been spotted taking her seat in the chamber as CEOs read their opening statements. Jamie Dimon started his remarks by thanking the government and tax payers for bailing out Wall Street during the crisis, saying the CEOs owe a "debt of gratitude". He went on to explain how post-crisis regulations have forced banks to hold more reserve capital, adding that "Lehman would never happen today." Before him, Citi's Mike Corbatt said his bank has streamlined its operations since the crisis to focus on its institutional and consumer businesses. The modern Citigroup isn't an insurance company, or a hedge fund - it's a bank. Morgan Stanley's James Gorman said his bank has taken steps to decrease its leverage and risk. All the CEOs so far have touted their bank's lending to small businesses, their philanthropic efforts like lending the children's hospitals and other nonprofits, and helping rebuild Detroit's power grid, and helping rebuild public housing in the Rockaways after Hurricane Sandy. Brian Moynihan said BofA has improved customer service and ended overdraft at the point of transaction to cut down on harmful fees, and pointed out that half of the bank's managers globally are women. Following Moynihan's statement, protesters in the audience interrupted the proceedings, forcing Waters to ask officers to remove them. Bruce Marks just stood up and started shouting--@RepMaxineWaters is telling him to stop. "Would you please remove this gentleman from my committee?" She says. "Come on officer we don't have a lot of time. Get him out of here." State Streets O'Hanley said his bank has more than doubled its holdings of high quality assets, while touting the bank's services for multinationals and retirees who build wealth in its ETF business. He added that the bank is committed to evaluating GSE considerations in all of its investments and making sure its operations benefit all of its stakeholdeers. BNY Mellon's CEO Scharf started by explaining exactly what a custody bank does "performing the nuts and bolts administrative functions of the financial system." The bank works with all stakeholders to provide transparency into global asset flows, and takes its specialized role in the global financial system seriously. Though BNY believes the global financial system is stronger today thanks to post-crisis regulations, it believes oversight should be continually reevaluated to confront new challenges. Last but not least, Goldman's David Solomon spoke of Goldman's work with endowments, pension funds and other institutions. Goldman's equity has more than doubled since 2007 and it has significantly reduced its leverage. "Dodd Frank has made the system safer"...but after ten years, it's important to reassess whether changes can be made to avoid redundancy. He also touted the "most expensive review" of Goldman's operations in the firm's history, to help it "learn from experience" while acknowledging that the bank "will inevitably make mistakes." Goldman's new consumer bank - Marcus - featured in Solomon's remarks, particularly the low fees it charges its customers. Update (905amET): Fresh off her now-infamous sparring match with Treasury Secretary Mnuchin, Chairwoman Maxine Waters started the hearing by reading a litany of the fines paid by the big banks since the crisis, and their tendency to treat the fines as "a cost of doing business" while achieving massive profits...remarks that, we imagine, have set the tone for the rest of the hearing. Waters waxed about the push to relax stress test requirements and capital rules, while expressing her concern that the banks have become too big to manage and service US communities. After months of preparation, "bash a banker day" (as Politico's Morning Money newsletter has christened it) has finally arrived on Capitol Hill. To wit, at 10 am, the CEOs of seven of the largest banks in the country will gather before members of the House Financial Services Committee for what's expected to be a free-for-all hearing. This will be the first time a group of bank CEOs has been hauled in front of Congress since 2009 during the aftermath of the crisis. This time around, the economic circumstances are better. Millions of Americans haven't just been kicked out of their homes, and the labour market has been expanding for more than 100 quarters. While the 'crisis' of economic inequality has stoked a revival of populist anger on both the right and the left, all things considered, the public has no obvious reason to hate on Wall Street right now (other than the fact that JPM CEO Jamie Dimon probably earns way more money than you do). But that hasn't stopped progressive Democrats from pushing the demonization of Wall Street as a defining issue of the 2020 campaign season. Expect clips from Wednesday's hearing to figure prominently in campaign ads next summer and fall. Democrats are expected to grill the banksters on range of topics, from their generous comp packages (which for some last year returned to levels last seen before the crisis), the relaxation of Wall Street regulations, their efforts to improve diversity and end pay discrimination, their relationships with big polluters and private prisons and - of course- economic inequality, as they try to show the public that they're 'holding megabanks accountable.' The executives said in prepared remarks that Wall Street reform enacted by Congress has made the system safer and less risky. Meanwhile, Republicans are expected to ask some tough questions about banks' decisions to cut ties with gun manufacturers and sellers. Many of the executives are approaching the hearing with trepidation. Earlier this year, former Wells Fargo CEO Tim Sloan was brutally chided by Elizabeth Warren during a Congressional hearing, then told once again that he should resign from the bank. He was out a few weeks later. Fortunately, as we said yesterday, the CEOs have an ace up their sleeve: JPM CEO Jamie Dimon, a seasoned veteran when it comes to dealing with Congress. Dimon is also the only one of the CEOs who was present at the last group hearing ten years ago. The seven CEOs' (Dimon, Citigroup's Michael Corbatt, Morgan Stanley's James Gorman, Bank of America's Brian Moynihan, State Street's Ronald O'Hanley, BNY Mellon's Charles Scharf and Goldman's David Solomon) prepared remarks can be found here.